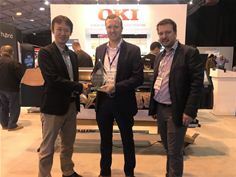 Egham, 2nd November 2017 – OKI Europe’s ColorPainter M-64s, a wide-format inkjet printer was awarded the Outstanding “Enhanced” CMYK Eco-solvent/Latex 54″/64″ Printer Pick Award 2018 at The Print Show by Keypoint Intelligence’s Buyers Lab (BLI). Competing against printers in Europe and the USA, the award is the result of months of hands-on evaluations performed by expert teams of analysts and lab technicians at BLI. Since launching the Eco-Solvent/latex test program in 2016, BLI has tested a host of Latex 54″/64″ devices in Europe and the United States, presenting their inaugural awards to the best performing products in four categories: Entry level CMYK Eco-solvent, Enhanced CMYK Eco-solvent, High Production CMYK Eco-solvent and Gamut Expansion Eco-solvent. BLI applauded the ColorPainter M-64s for its productivity and exceptional dimensional stability in highly accurate multi-panel artwork. In addition to those advantages, it was also recognised as the only device to achieve excellent rating for the reproduction of the greyscale. The easy-to-use ColorPainter M-64s by OKI Europe has revolutionised the wide-format print market with innovative technology and features that drive efficient, high-quality and unmatched graphic output at unrivalled speeds. High-viscosity, low-odour, eco-solvent SX inks improve working environments, achieve a wide colour gamut and high-density colours resulting in superior, long-lasting print images with lower operating costs, making it ideal for a broad range of interior and exterior applications from vehicle wraps to backlit displays. Keypoint Intelligence is built upon two brands: Buyers Lab (BLI) and InfoTrends. It is the integrated research company of InfoTrends conducting research activities on the digital imaging market globally and BLI evaluating printers, multifunction peripherals, scanners, and related software.